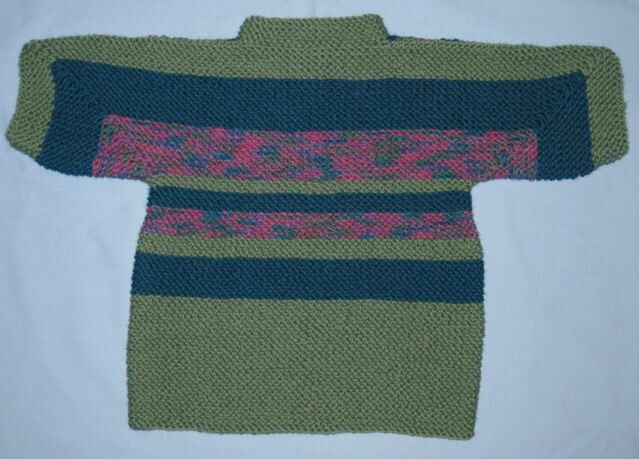 BSJ #3 was knit on size 8 needles out of Lion Wool (Sage, Dark Teal, and Flower Garden). 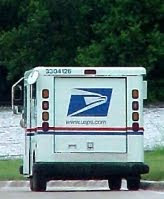 The three sweaters (BSJ #1, BSJ # 2, and 3 will be sent to Father's House in Ohio and then sent to orphanages in Europe. 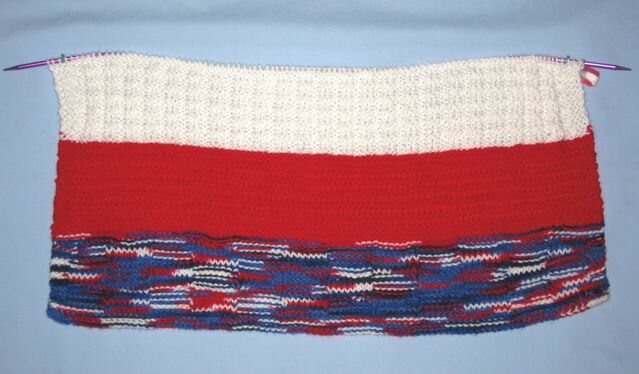 Betsy Ross is a Midwest Oddball Blanket and knit on size 8 needles. 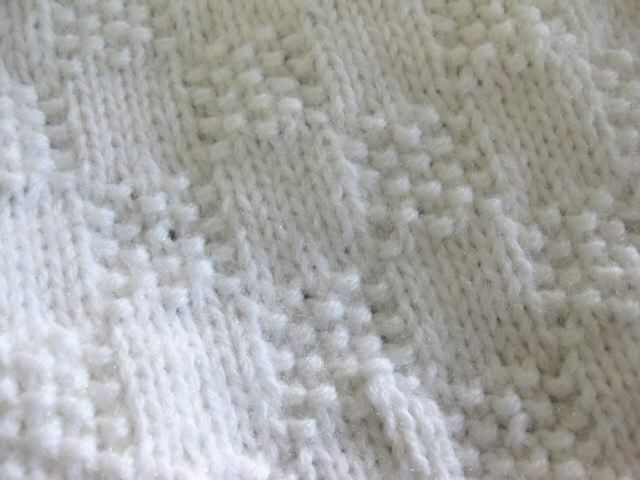 I used Caron Simply Soft (White) for the Checks and Ridges stitch. 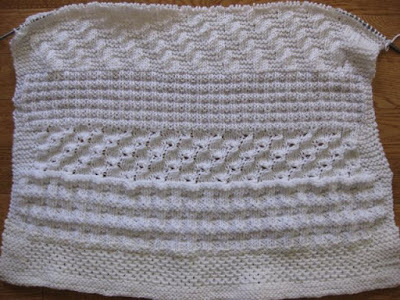 Snow White is a Midwest Oddball Baby Blanket. 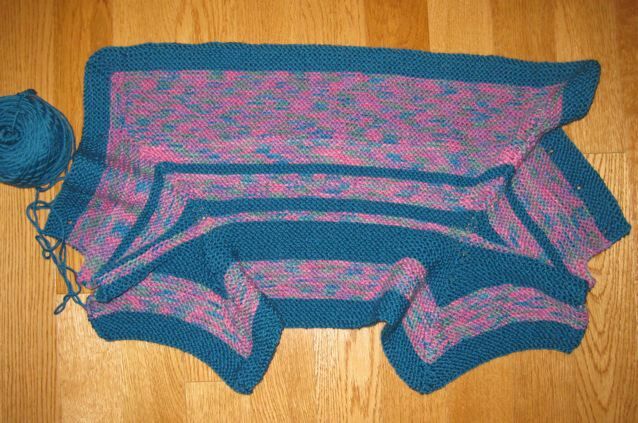 It is knit on size 9 needles. I used the Garter Steps stitch and Caron Simply Soft (White) for my section. I started this BSJ before I seamed the shoulders on the sweater in yesterday's post, so I didn't just knit it overnight. 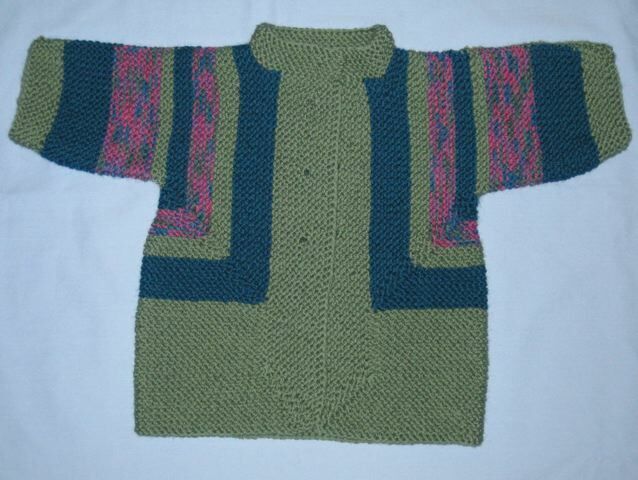 It is made with Lion Wool (worsted on size 8 needles). 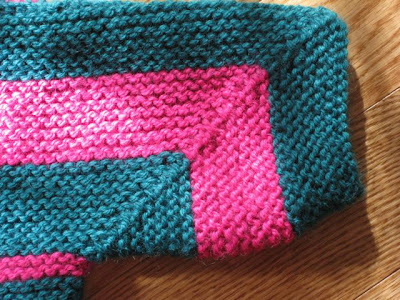 The BSJ is quick because is comprised of 115 rows of knitting and an optional collar. It is knit in one piece, and is a gangly-looking thing before seaming. The sleeves are formed by folding the edge up to the shoulders. The shoulder edge is then seamed. I use bobby pins to clip the two edges together. 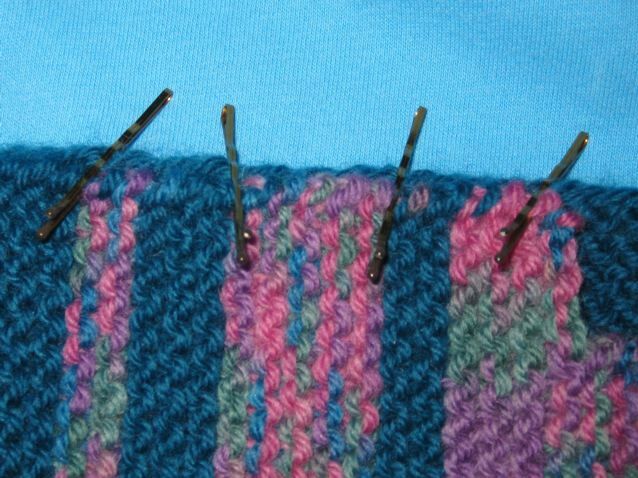 The pins work great because the tips are smooth and do not snag the wool and are easily removed. By using a mattress stitch, the seams are barely visible. 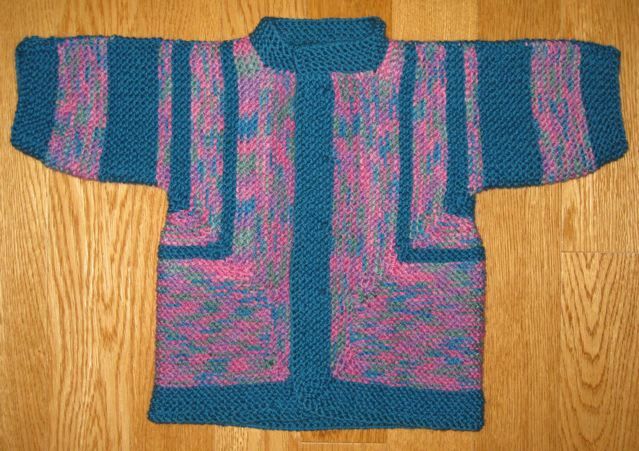 This sweater sports a mandarin-type collar. I haven't found the right buttons yet, but they will be added soon. 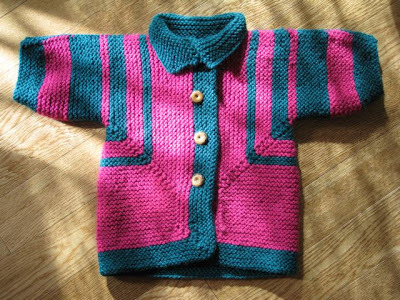 Every knitter should make at least one Baby Surprise Jacket (BSJ), a pattern designed by Elizabeth Zimmerman (EZ) in 1968. It is phenomenal how the sweater is knit in one piece, entirely of garter stitch, and requires only two seams at the shoulders. Strategic increases and decreases provide the shaping for the sleeves and body. This is the second BSJ that I've made, and I have another one on the needles. 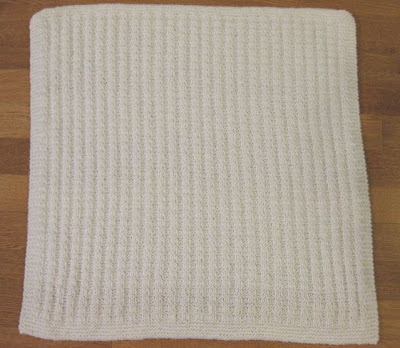 The first one (pictured here) was made from acrylic baby yarn, but this one is made from a worsted acrylic/wool blend on size 8 needles and using 6 ounces of yarn. I added the collar that is explained here. 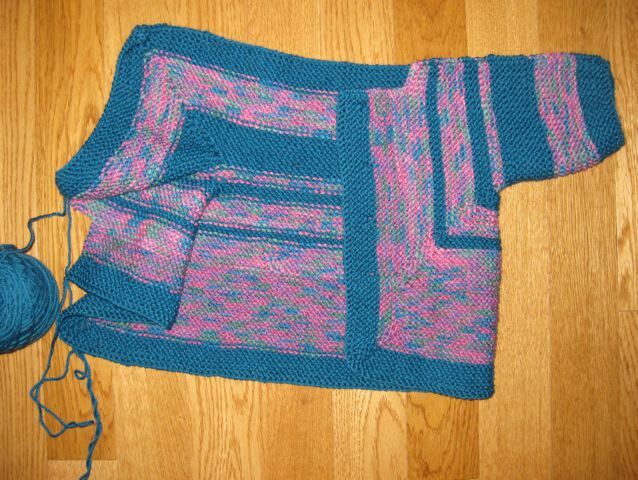 If I hadn't run short of yarn, I would have made the collar deeper. 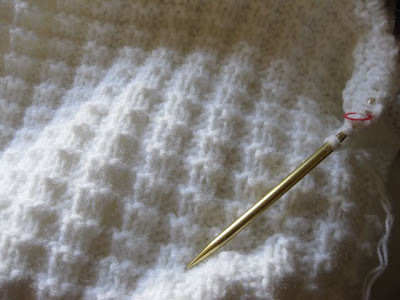 A hood can also be added to the basic sweater. The pattern works well with scrap yarn stripes. 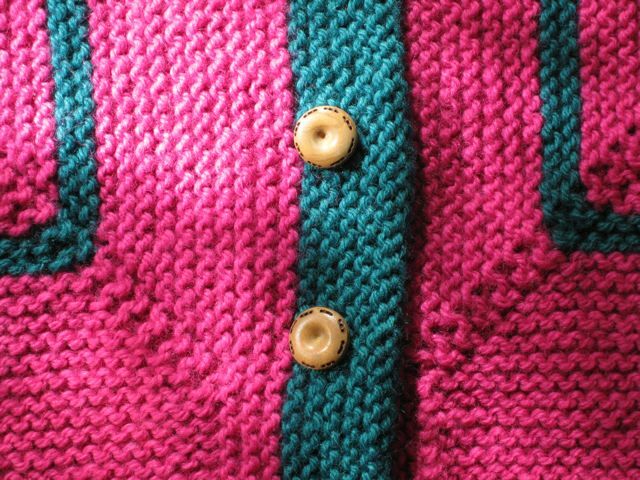 Since the sweater is knit in one piece, the stripe pattern is different on the front and back, especially if they are at the beginning of the sweater. You will notice that the sweater is a little fuller under the fourth teal stripe. This is done to allow for the bulk of a diaper. Didn't EZ think of everything? The pattern is available at Schoolhouse Press. 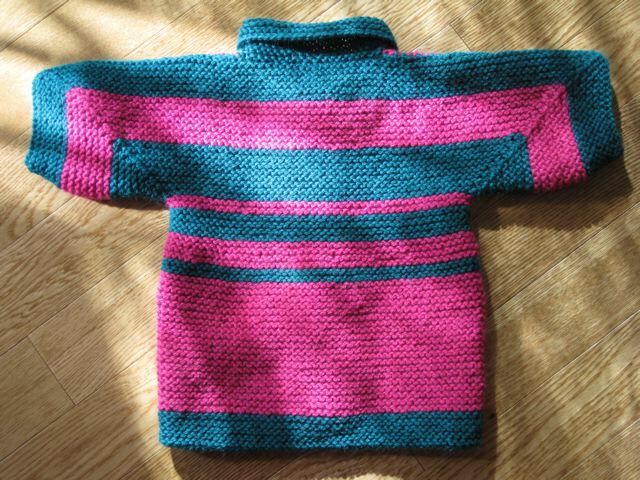 I recommend ordering the A-B-C-SJ (Adult, Baby, Child's Surprise Jacket) not only for the multiple sizes but also because the directions are quite a bit easier than the original pattern. 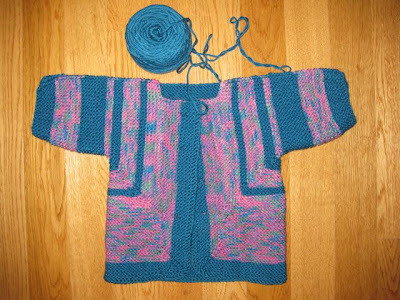 The DVD is also extremely helpful and includes the pattern for the BSJ in infant sizes. 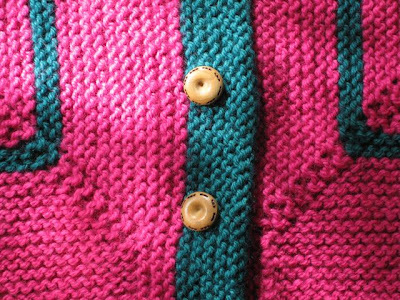 This sweater is a true delight to knit. Saturday was the annual yard sale in addition to a support group meeting. It was a long, busy day, but I found an item that has been on my Wish List for ages. 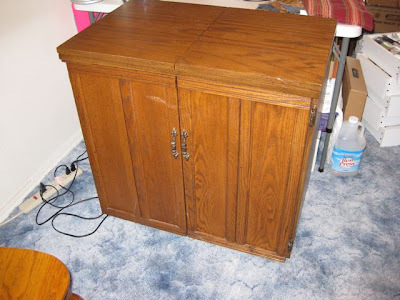 When I first saw the cabinet, I thought it was a buffet server because my sister has one that is similar in design, but when I opened the top, I could hardly contain myself: it was actually a sewing machine cabinet. 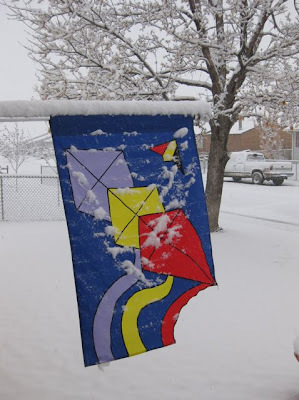 I begged my friend's husband to haul it to my house, and after church Sunday morning it didn't take me long to get it into the house and in my sewing room. I am in heaven! 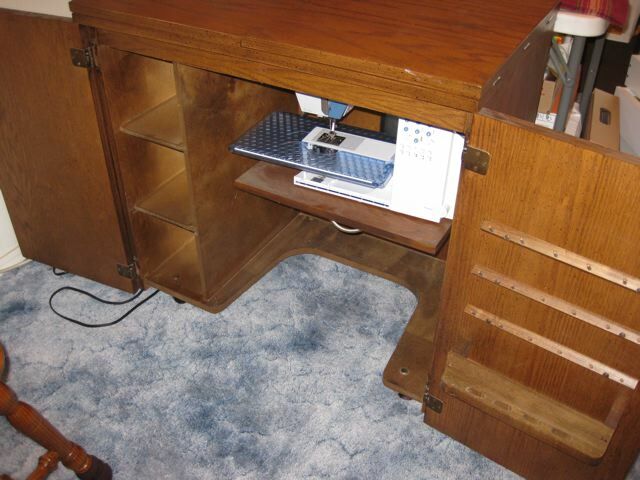 The cabinet was not designed for a Bernina, but the detachable table that came with my machine fills up most of the space. The best part - it has a lift so I can raise and lower my machine. It is a bit stiff, but I think some WD-40 will cure that issue. I got this cabinet for $25. It is in near perfect condition with only a scratch on one of the front doors. I may actually do more sewing now that my machine is not three higher than the table's surface. The next item on my wish list is an adjustable chair. Saturday, I discovered that Dreams Do Come True, so I'll Dream On! My sister Marilyn is making a cross-stitch replica (16 x 24 inches) of her grand daughter's graduation photo. 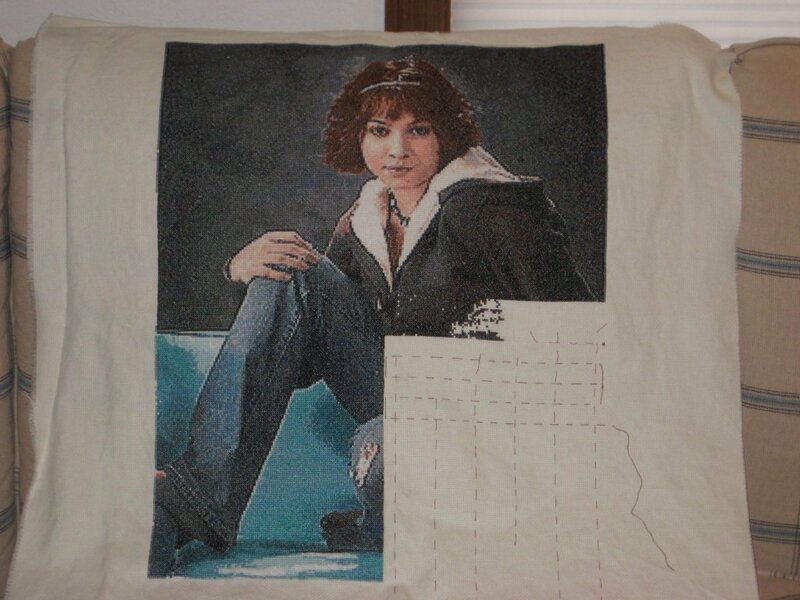 This is the third photo she has cross-stitched: the first was her grand daughter's junior photo, then her grandson's graduation portrait, and now this portrait. Here is the finished replica of her grandson. The original photo is in the bottom right corner. 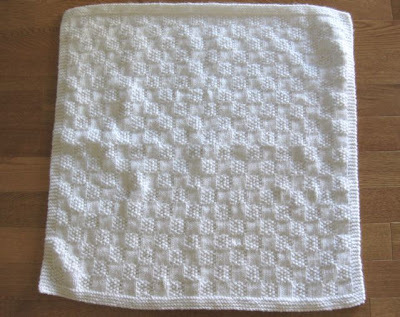 Even the white background is made of individual stitches. These portraits are a labor of love. I am not so sure that I would have the patience or the tenacity to take on such a project. Another snow storm hit the area on Tuesday, dropping 6 - 7 inches. 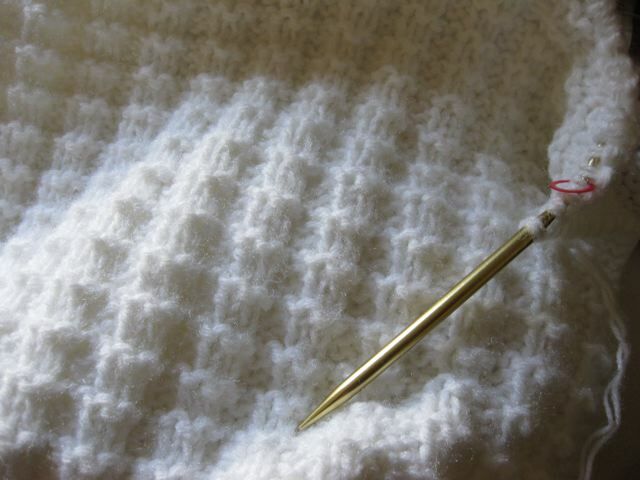 The miserable weather inspired me to make a pot of chili and to knit on Snowdrift. I finished the blanket last night (Wednesday) just as the late news was ending. The blanket (27 inches square) was knit on size 10 needles, using two strands of Caron Dazzleaire Petite (White) and the Checks and Ridges stitch. These late snow storms have two benefits: they melt quickly and they produce a lot of needed moisture. I am hoping this snow-inspired blanket signifies the end of winter's fury. Snowdrift is a work in progress. 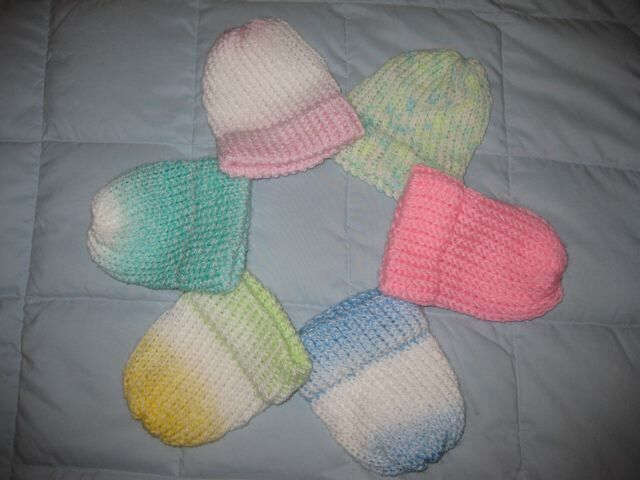 Two years ago, All Crafts for Charity (an online craft group) sponsored a drive to supply hats to my local hospital's nursery. I was overwhelmed by the generosity of the group: individuals sent over 300 hats to be given to newborns. Two weeks ago, Barbara (one of the AC4C members) made contact and wanted to send more hats. She makes them on a regular basis and will send them throughout the year. I am honored to accept her donations on behalf of the hospital auxiliary. It's my goal to empty my acrylic yarn bin this year, which will require some furious knitting, but I think I can do it. 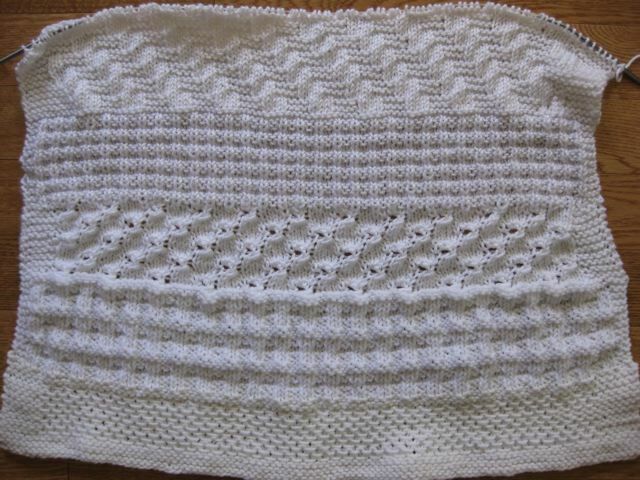 Six skeins of Caron Dazzleaire Petite (White) double-stranded, resulted in Snowflake, a baby blanket. I used size 8 needles and a seed stitch block pattern. 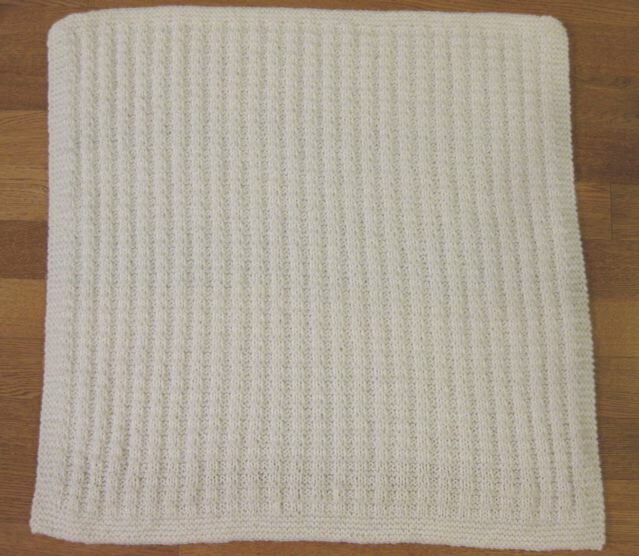 Each block is 5 stitches wide. 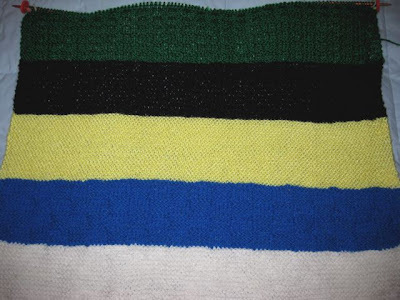 Olympic Rings was started by the West Coast Oddball Knitters in honor of the 2010 Winter Olympics. 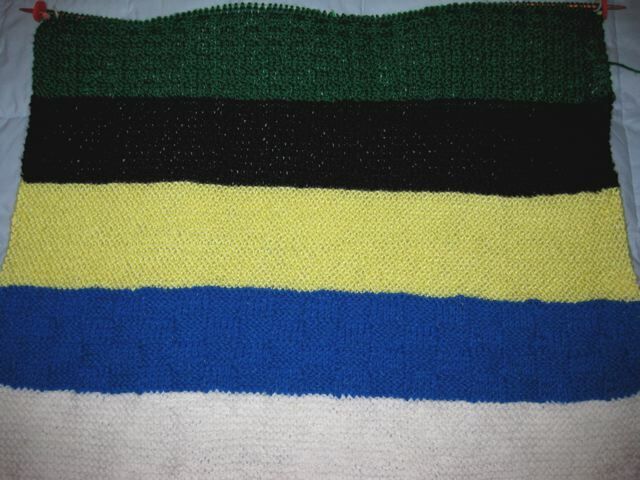 The color of each section represents the Olympic rings. 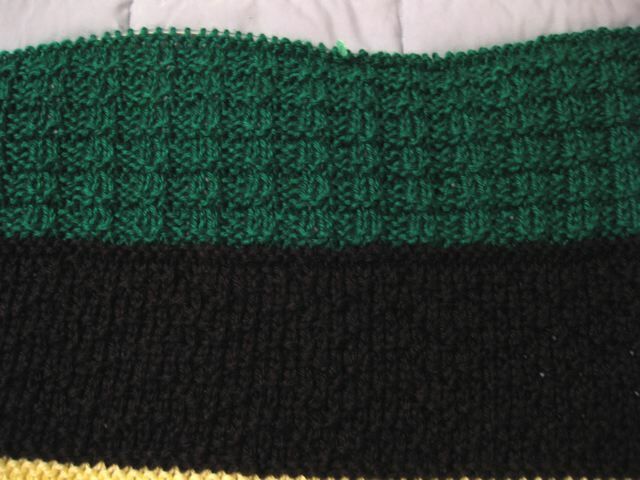 I knit my green "ring" using Caron Simply Soft and the Checks & Ridges stitch. It appears that Mother Nature has a sense of humor, but I am not amused! Taken at 8 AM on April 1st. Two inches on the ground and a light, steady snow still falling. Predicted accumulation today 2 - 4 inches with snows continuing tomorrow. Oh yeah, Mother Nature is a real jokester! Side Tracked is on its way to Louisiana! I spent yesterday afternoon preparing the backing and the binding, and all are now in a package on in the mail. Kathy graciously offered to machine quilt the top after she read yesterday's post. I accepted her generous offer and asked her to donate the finished quilt to a charity of her choice. 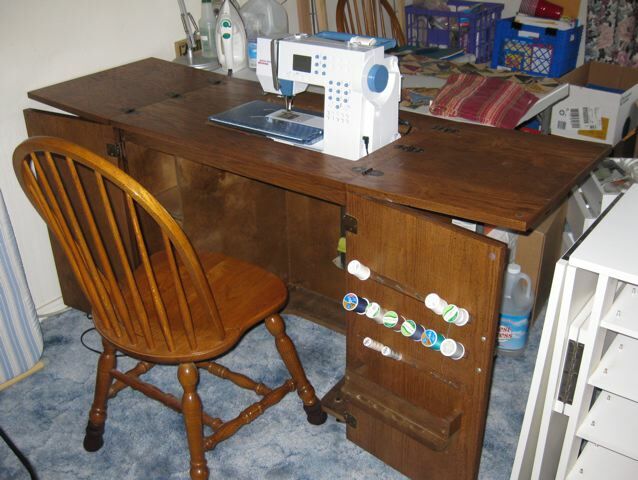 Thank you, Kathy for providing the batting and for sharing your machine quilting talent.